Los Angeles MMA: QC 7 Results | MMA Fighting Events Videos Techniques UFC Fight Picks and News. 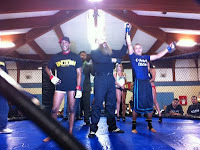 Ring of Fire and Old School Promotions brought MMA back to the Los Angeles area Friday night with a 10 fight MMA card. Quake in the Cage 7 featured some of the best up and coming fighters from some of the best MMA gyms and fight teams in the Los Angeles area. It was an exciting night of fights, capped off with an after party sponsored by Chingasos MMA. Here are the results and recap of the MMA fights at Quake in the Cage 7. Recap: These two came out blazing with chingasos. Both connected with strong punches to the face. Mid round Lightfoot took the fight to the ground with a double leg takedown and controlled the fight from there attempting several chokes. Cassano started the second round with some punches and followed with a kick that Lightfoot was able to catch and then take the fight to the ground. Lighfoot controlled the round from there almost finishing a rear naked choke. In Round three, Cassano began a quick attack but Lightfoot countered with an explosive double leg takedown which culminated in landing across the ring and up against the cage. Late in the round Cassano reversed the position but ended up in a triangle choke position. Results: Kenneth Lighfoot wins via judges unanimous decision. Recap: The fighters started this one by exchanging leg kicks for a while. Mid round Flach completes a text book double leg takedown as Vegas attempted another kick. In Round two, Vegas opened up his stand up and unleashed kick and punch combos. Flach was able to get a hold of a leg, picked Vegas up and slammed him to the mat where he controlled the rest of the round. Flach starts round three with a nice right hand that land nicely on Vegas. He then pushes Vegas up against the fence and locks him up. Late in the round Flach puts Vegas on his back and grinds out the round there. Results: Mike Flach wins via judges decision. Recap: Cash comes out firing a right hand and then charges into Gonzales pushing him up against the fence. A clinch battle ensues at the fence but eventually Gonzales is able to get the fight to the ground and puts Cash on his back. In round two, Cash quickly clinches and aggressively attempts a takedown. Gonzales fights off the attempts and late in the round takes Cash down finishing the round in his guard. Results: Cash is unable to answer the bell for round three and Fabian Gonzales is awarded the win. Recap: The first round was a grappling exhibition with both fighters using excellent ground grappling techniques to constantly reverse positions. Round two was another excellent showcase of grappling skills but this time Chavez was able to dominate most of the round. He started with a double leg takedown, takes the back and works from the back position for a while until Martinez escaped. Chavez was able to score a nice Judo style takedown to get the fight back to the mat. In Round three Chavez pours on the aggression. He complements his grappling with hard punches that stifle Martinez. Chavez finishes round three with a nice slam that served as an exclamation mark on the fight. Results: Erik Chavez wins via judges unanimous decision. Recap: Bakanyan attacked with kicks and Puncel countered with hard punches for most of the first round. In round two Puncel kept Bakanyan at bay with hard punches. Late in the round Bakanyan attempted a double leg takedown and ended up in a guillotine choke but survives. Round three featured more hard punching from Puncell that kept Bakanyan from opening up an attack. Mid round Bakanyan finds an opening and lands a spinning back fist that sent Puncel to the mat. Puncel quickly made his way back up and continued to stalk Bakanyan with a cocked fist and looking for an opening. Puncel finishes strong with a hard punch and clinching up against the fence. Results: James Puncel wins via judges split decision. Recap: A few moments into the first round Lee floors Perez with a strong leg kick. From there Lee is able to dominate the ground game eventually taking mount, pressing the fight up against the fence and finishing with ground and pound. Results: Akkim Lee wins via ref stoppage. Recap: Garcia wastes no time in diving in for a takedown and getting the fight to the ground. He dominates the ground game, eventually taking the back and locking up a rear naked choke. Camarena fights it off and survives into the second round. In the second round, Camarena comes out more aggressive but Garcia quickly counters the aggression with another takedown. Camarena fights to get back on top but falls into a triangle attempt that Garcia holds on to from different positions for most of the round. Garcia opens up round three by diving into another takedown. From there he quickly moves into side control and sets up and arm bar which he eventually finishes. Results: Cristian Garcia wins via arm bar submission. Recap: These two come out guns blazing exchanging punches in bunches. Lopez catches Gonzales a bit off balance with a punch and Gonzales hits the mat. Gonzales a little too eager to get up gives Lopez an opening to set up a guillotine. Lopez locks that guillotine up and doesn't let go until Gonzales goes limp and the ref jumps in. Results: David Lopez wins via guillotine choke. Recap: Dakota comes out with a crazy Karate crane kick that lands on Velasco's face. The kick electrifies the crowd but Velasco is unfazed and actually catches the the leg on the recoil and slams Hughes to the mat. Velasco then goes beast mode and starts a vicious ground and pound attack that finishes the fight. Results: Isaac Velasco wins via ref stoppage. Results: These two come out firing off kicks and then engaging in a clinch battle. Both fighters score takedowns but keep the action moving scrambling around for position. Morales makes a mistake and Ware capitalizes by putting him in a tight triangle. Morales survives the attempt. Round two starts off with a chingasosfest. Both fighters trade until Morales sees an opening and dives in for a double leg takedown. Ware is able to avoid major damage and makes his way back up. Morales stays close and scores another takedown where he's able to land a few hard shots. Morales starts round three by firing off a combo and then diving in for a takedown. Ware is able to fight it off and the fighters begin a grueling clinch battle which eventually Morales wins by taking the fight to the ground. Morales briefly takes the back and works for a rear naked choke but ware reverses and ends up on top. Results: In a grueling three round battle, Rocky Morales wins and becomes the new Quake in the Cage Bantamweight Champion via split decision. Stay tuned for the next MMA event in the Los Angeles area. For photos check our Facebook Page.